This remote-viewing investigation answers the questions of who built the Great Pyramid of Giza, why was it built, and for what was it originally used. 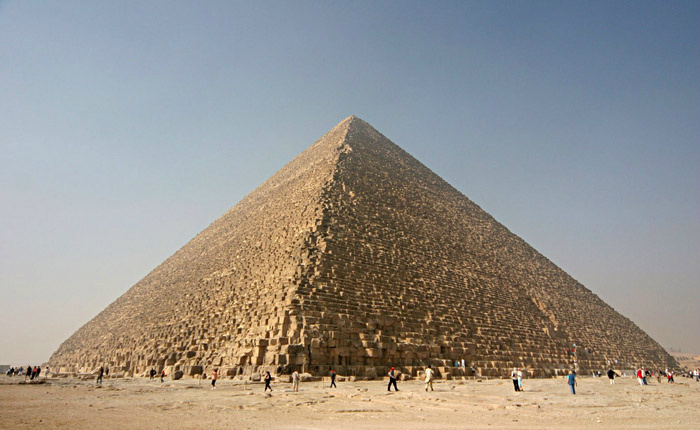 This pyramid is alternately known as the Pyramid of Khufu, or the Cheops Pyramid. NOTE: There are six targets for this project, Targets 7a through 7f. Two of the targets are nearly identical in wording for this series. That is, Target 7a is essentially the same as Target 7d. The reason this was done is because of the concern that the picture of the pyramid found in Target 7a might draw all viewers to the pyramid itself rather than the actual target as defined in its wording. Target #7a: The target is the mining of the largest rocks used in the construction of the Great Pyramid of Giza (also known as the Pyramid of Khufu, or alternatively, the Cheops Pyramid) as shown in the image above. The viewer should perceive the location of the mining operation where the majority of the largest rocks were mined, and the process of mining the rocks. The date and time of the target should be that which is optimal for perceiving the mining processes employed with respect to the largest rocks used in the construction of the pyramid. Target #7b: The target is the actual construction of the Great Pyramid of Giza (also known as the Pyramid of Khufu, or alternatively, the Cheops Pyramid) as shown in the image above. The viewer should perceive the the construction of the pyramid with respect to the largest rocks used in the construction. In particular, the viewer should perceive how the largest rocks were moved into position during the construction process. The date and time of the target should be that which is optimal for perceiving the construction process involving the largest rocks used in building the pyramid. Target #7c: The target is the Great Pyramid of Giza (also known as the Pyramid of Khufu, or alternatively, the Cheops Pyramid) as shown in the image above, as the completed pyramid is being used for its originally intended purpose. The viewer should perceive the activities involved with this originally intended purpose. The date and time of the target should be that which is optimal for perceiving the activities associated with the original purpose of the finished pyramid after the completion of its construction. Target #7d: The target is the mining of the largest rocks used in the construction of the Great Pyramid of Giza (also known as the Pyramid of Khufu, or alternatively, the Cheops Pyramid). The viewer should perceive the location of the mining operation where the majority of the largest rocks were mined, and the process of mining the rocks. The date and time of the target should be that which is optimal for perceiving the mining processes employed with respect to the largest rocks used in the construction of the pyramid. Target #7f: The target is the subject or subjects who originally conceived of the idea of building the Great Pyramid of Giza (also known as the Pyramid of Khufu, or alternatively, the Cheops Pyramid) as shown in the image above, at the time when this subject or subjects were conceiving of the idea and planning to develop the project. The viewer should perceive and describe the location of the subject or subjects when they are conceiving of the idea. The viewer should observe the thoughts of the subject or subjects so as to understand the reason for building the Great Pyramid of Giza.